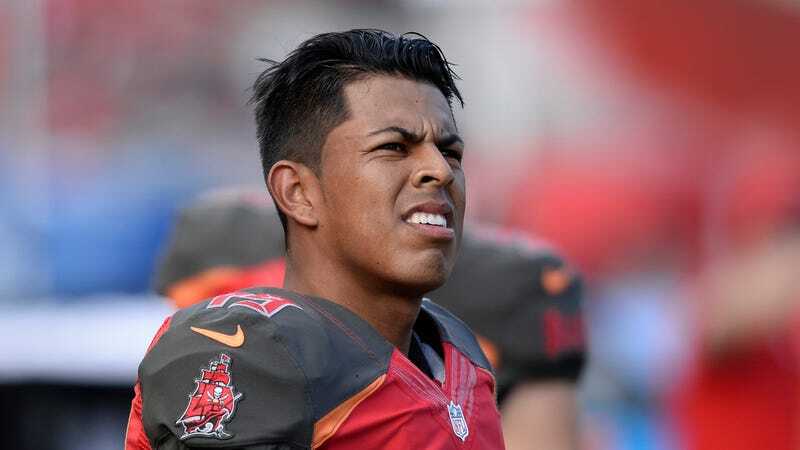 Roberto Aguayo, the most accurate kicker in college football turned second-round disappointment for the Tampa Bay Buccaneers, is still struggling to kick the football through the goalposts. Aguayo missed “at least three” of four kicks in a competition at the Buccaneers’ OTAs today. The goal posts were narrower than normal (8.5 feet versus 18.5), but that didn’t seem to pose a problem for Tampa Bay’s newly signed veteran kicker Nick Folk, who nailed all four. The first clanked the right goal post from 30 yards. After [Aguayo’s] third effort, practice went silent. You could hear a pin drop. Ninety players plus coaches, many just BSing and drinking water during the kicking period, were quiet. Nick Folk then stepped and up and drilled kicks into the narrow uprights from 30 yards, then twice from 35, followed by a 40-yarder — a perfect 4-for-4.